The most important parts of a successful rat-control program are population control, which means reducing the overall number of rats in a given area by making it a less suitable habitat for them; and exclusion, which means sealing them out of particular buildings and places. Killing individual rats is almost useless without reducing the overall population of rats and excluding them from your building. Without population control and rat exclusion, "new" rats will move into treated areas as quickly as the "old" rats are exterminated. Reducing the amount of food and water available by implementing proper sanitation and waste management procedures. This may involve outreach to businesses and residents stressing the importance of proper sanitation to effective rodent control. Reducing available harborage areas (places for the rats to live) by cleaning up refuse and debris in rat-infested areas. Proper landscaping and grounds maintenance to reduce the attractiveness of an area to rats and make rat activity more obvious to humans. Continued monitoring to evaluate the ongoing effectiveness of the rat population control program. Rat exclusion means taking steps to keep rats out of building by sealing them out. I could go into a great deal of detail about this; but because the National Parks Service has already done that, I'm just going to refer you to their excellent Rodent Exclusion Manual, which you can download here. It's an old manual -- more than 20 years old, in fact -- but it's still the best rodent exclusion manual I've ever come across. Sealing rats out of your home or building is all well, good, and necessary, but the rats that are already inside also have to be removed. For this part of the job, I recommend trapping. 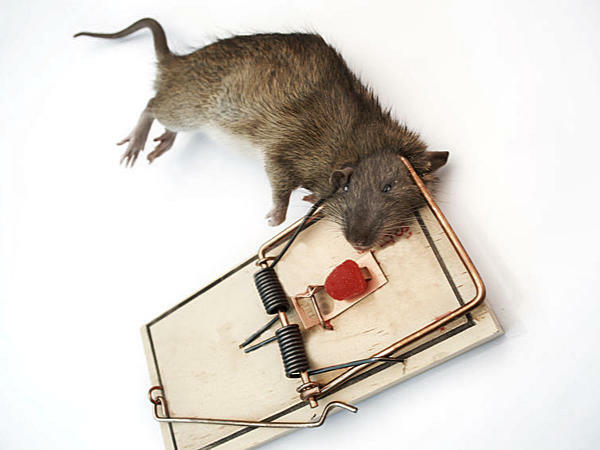 Trapping is the fastest and safest way to eliminate rats from inside a home or building. There is almost never a reason to use rat poisons inside a building. Trapping avoids the use of toxic pesticides and any associated risks to children, non-target animals, and the environment. Trapping, if done properly, will reduce rat populations much more quickly than poisoning them will. Traps prevent poisoned rodents from dying in walls, ceilings, crawl spaces, and other inaccessible places where their rotting carcasses would cause odors and create a health hazard. Rat traps are very similar to mouse traps, only larger. Here are some of the more popular and effective kinds of rat traps available today. 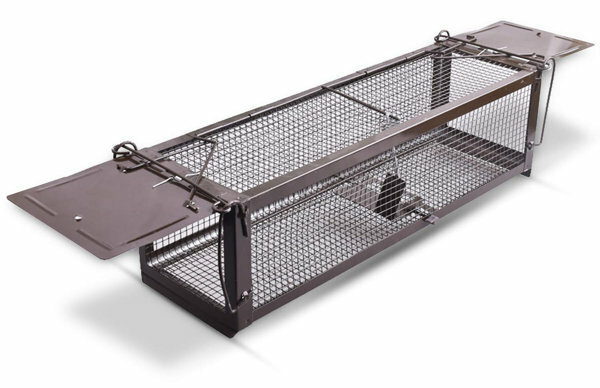 Snaps traps are one of the oldest styles of rat traps, and are still one of the best. They're inexpensive, effective, and easy to use, and despite what some people believe, very humane when used properly. I recommend that you use rat snap traps with the small metal trigger, like the one in the picture, not the ones with the extended triggers. In my experience, rat traps with extended triggers are too easily tripped when the rats merely sniff at them. That usually just scares the rat and teaches them to never go anywhere near a snap trap again. For best results, snap traps should be "pre-baited" by baiting them for a few days without actually setting the bail. Rats are xenophobic and will avoid new objects in their environment for several days. If the trap snaps the first time a rat tentatively extends a whisker toward the bait, that rat will never go near a snap trap again. So pre-bait the traps for a few days. Once the rats have overcome their initial fear and are taking the bait, re-bait the traps and set them all at the same time. Snap traps should be baited with small amounts of bait attached securely to the triggers. You don't want to use too much bait. The idea is to force the rat to put its snout right up to the trigger and yank at it to get the bait. That's the best way to get a clean, humane kill. Good baits for rats include peanut butter, gumdrop candies, bread dough, and my personal favorite, salami. I've had rats take salami when all other baits failed. Rat traps should be placed with the trigger end along the rats' travel paths, which usually (but not always) will be along walls and other vertical surfaces. I've had good results placing snap traps about 2 or 3 inches (about 5 to 7.5 cm) away from walls or other travel paths, perpendicular to the travel path, with the trigger end closest to the travel path. So if the travel path is a wall, I would place the traps about 2 or 3 inches (about 5 to 7.5 cm) away from the wall, with the trigger side facing the wall. Many exterminators prefer placing the trigger ends of the traps right up against the wall, but I've had better success leaving a small gap between the wall and the trap. My guess is that it's less scary to the rat the first time it comes across the trap if there's still space for it to get by than it would be if the trap were blocking its path. Obviously, rat traps should only be placed in areas where pets and small children won't come across them. Rat glue traps are another popular non-chemical rat control device. They are considered somewhat safer than snap traps, which can cause serious injuries to human fingers and toes if accidentally touched. They also tend to be less scary to rats, so they are less likely to avoid them. They are used by simply placing them in the rats' travel paths, with or without a bit of food on them as bait. Some glue traps are pre-baited with various food scents, which may or not work. Most exterminators put a bit of bait on the centers of the traps. The same baits that work on snap traps also work on glue traps. There are several disadvantages to glue traps. One is that they work only in dry, relatively clean areas. A rat with wet feet can walk right across a glue board without getting stuck. They also become ineffective when they get coated with dust. Finally, all sorts of other things, such as people and pets, can get stuck to them. When that happens, the glue usually can be loosened with a bit of cooking oil. Another serious problem with glue traps is that they are widely considered to be inhumane and are even illegal in some places. Rats who get stuck to the traps may not die for several days after getting stuck, during which time they usually squeal like banshees keening for the dead. In addition, if the rat is still alive when you check the trap, then you will have to kill it yourself by drowning it, breaking its neck, decapitating it, or shooting it. If that makes you squeamish, then don't use glue boards. 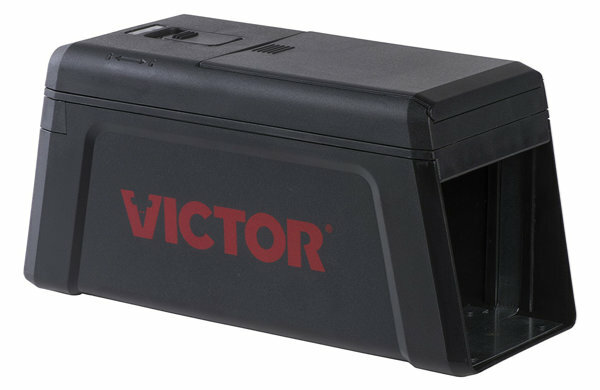 Electrocution rat traps, like the Victor M241 trap shown here, are a more modern, cleaner, and more humane way to non-chemically control rats. They're also less messy than glue boards and easier to use than snap traps. Most electronic rat traps are baited either with a special bait or with common rat baits like peanut butter, cheese, oats, salami, or nesting materials. They're then placed in or alongside the rats' travel paths. When a rat enters the trap, it immediately receives a lethal electric shock. Of course, for maximum effectiveness, the batteries must be fresh. Each zapped rat reduces the remaining zaps; and even if no rats enter the trap, the batteries will eventually discharge. Some traps have battery indicators built-in. For those that don't, just follow the manufacturer's recommended battery-change interval. A few electronic rat traps use rechargeable batteries or run on AC current. As with any rat trap, only place electronic rat traps where children and pets won't come across them. Also, most of these traps are for indoor use only and are not weatherproof or water-resistant. Live animal traps, such as the MDee Humane Live Trap shown here, are a good alternative if you don't want to actually kill the rats, but prefer releasing them to the wild where they can take their chances with cats, foxes, snakes, and birds of prey. As their name implies, live traps are designed to trap animals unharmed so they can be released elsewhere. Sometimes, however, the animals may injure themselves trying to get out of the traps. Unlike the other traps on this page, live traps can also be used outdoors and pose little risk to non-target animals, who can simply be released if they are caught. The same baits can be used as those used on snap traps, but baits that can be washed off by the rain should be avoided. I recommend that you use a two-door trap for rats. They seem to be more willing to enter a trap if they can see through it. In many areas, live-trapping of rats and/or releasing trapped rats into the wild is illegal due to their being considered a public health threat in their own right. Check with your local authorities before buying or using live rat traps. Know the rats' travel paths. You can usually find this out by looking for footprints, tail prints, gnawings, or faint greasy rub marks along vertical surfaces. If in doubt, place a light dusting of corn starch or flour on the floor in areas where rat activity is suspected, and then look for footprints and tail prints the next day. Rodent urine will fluoresce under a black light. This can help you pin down the travel paths of hard-to-catch rats. Choose appropriate baits. Rats will generally choose baits that are supplementing dietary needs that are not being met elsewhere. So try a few different baits that are not available to the rats from other sources, and see which one they like. Some baits that have been used successfully include peanut butter, smelly cheese, gumdrops, oat cereal, salami, bacon, raisins, and dough balls. Be sure to set enough traps. Most rat traps are only able to catch one rat at a time, so make sure to set enough traps based on your estimate of the population size.